What the Japanese earthquake means for the global markets. Japan, the third largest economy in the world was already struggling to get out a major recession. On Friday, the nation was shaken up by a 8.9 (9.0 as measured by authorities in Japan) earthquake followed by a tsunami. This certainly has a big, if not huge impact on its economy. Since economies are interconnected globally we will see (and already have seen) a ripple effect on all economies in the world. Today the Nikkei lost a whopping 633 points, more then 6%! European stock markets were down because of it and the Dow Jones is trading now lower on worries on Japans economy. A logical follow-up question for investors and traders alike is, how much lower will it go, and where to go from here. A nuclear reactor with the possibly of blowing up doesn't make investment decisions any easier. It certainly tossed some unwanted things in my trading plan. Oil seems to have settled in around the $100 a barrel range, but can spike any moment depending on developments in the middle-east. In other words, the economy on a global scale is a big mess. And market direction is pretty hard to find with so many outside sources pulling and pushing the volatility needle. So is there any good news? Maybe. 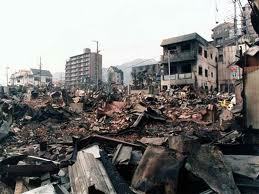 The area where the tsunami struck in Japan eventually needs to be rebuilt. Already there is speculation in the steel markets etc, but this won't happen anytime soon. Putting your money in 'rebuilding Japan' commodities seems a little too risky to me at the moment. There are however a few things we can keep our eye on. Like I said before, the Nikkei lost over 6% in its first trading day, as expected by everyone, but is this a panic reaction? 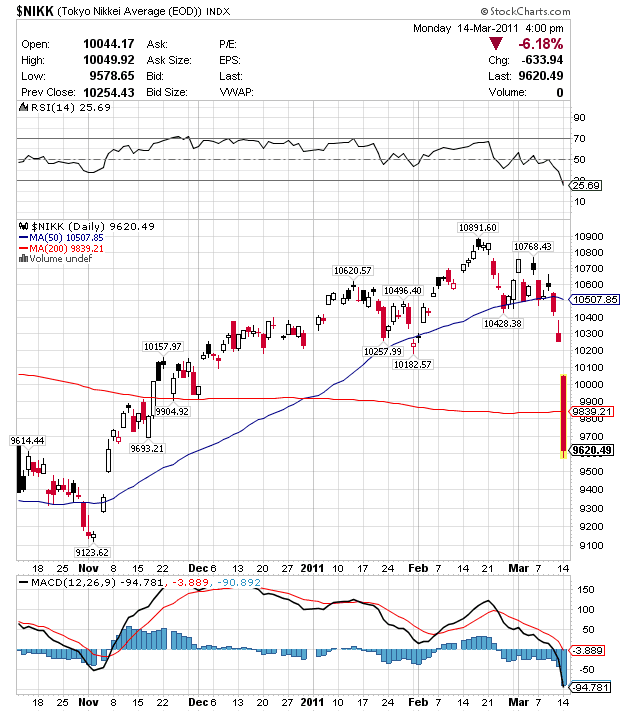 Are Japanese stocks oversold? In this case, technical studies indicate they are severely oversold, is this a reason to buy in 'cheap' Japanese stocks and ETFs? I don't think so. If that nuclear reactor blows up stocks may slide even further. At the moment, if you have to enter this market what I can come up with is the EWJ Japanese ETF. 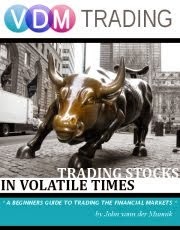 Volatility also means that a lot of money can be made, which is exactly the case in this instance. Currency trading wise, there is not much volatility in the USD/JPY... the Yen seems to gain strength, which is bad for exports and bad for the Japanese economy. A little bit of good news is that the VIX (VXX; panic index) seemed to have settled a bit. This is a major indicator at the moment for overall market direction. I'm not going to speculate on Japanese markets, but more on what's going on at home. In the case of the market settling down, my eye is on the SPY and DIA. 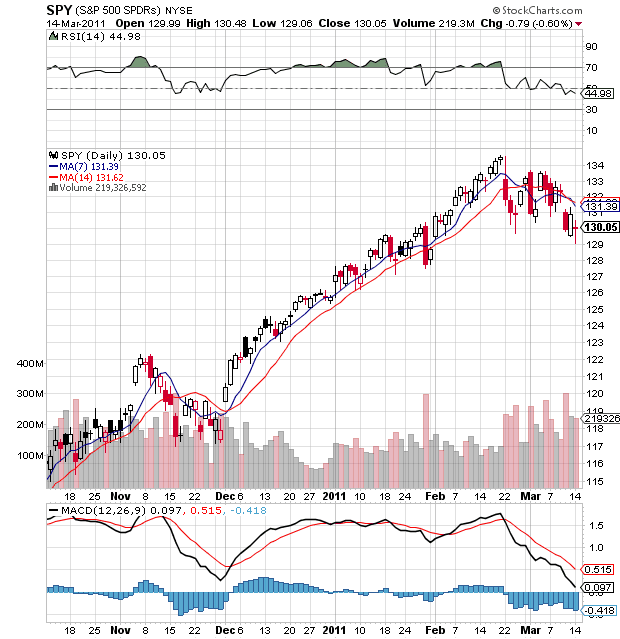 (SPY is actually right on track according my analysis) It's very important to keep a close eye on the markets this trading week. Furthermore, I'm bearish on Japanese stocks, especially major well known companies such as Toyota (TM), Sony (SNE) etc. Be cautious, if you have any trade recommendations in this market post a reply! Which equities are you bullish or bearish on? Let me know!